Barn dancing is one of those rare and exciting things that is as much a social event as it is a dance. Sometimes also called a ‘hoe-down’ or a ‘Ceilidh’, a barn dance usually involves folk music coupled with traditional or country dancing. Though often held in a barn, barn dances can be held anywhere and can sometimes be more of a mixer than a dance. 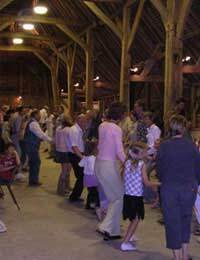 Barn dances tend to feature live music, a ‘caller’, food and drink, community recreation and dance that is in keeping with the traditions of the country or region. Although barn dances tend to concentrate on traditional English dance and music, sometimes in the U.K., what is referred to as a ‘barn dance’ is often, in fact, a Ceilidh. Though similar in spirit, these two events differ slightly. A Ceilidh usually features mainly Celtic music and traditional Irish or Scottish dancing. However, Scottish Ceilidhs are different from English Ceilidhs. Scottish Ceilidhs gained a great deal of popularity amongst Scottish youths between 1997 and 2001. Though an underground culture of these parties now exists, where bands play and invitations pass by word of mouth, there are also public Scottish Ceilidhs and private Ceilidhs held among families for special events. They often combine live music with a DJ and feature a combination of modern forms of Scottish dancing, old time dancing and ballroom dancing. English Ceilidhs are based also upon the Irish and Scottish dance traditions, but fall more under the category of English Country dance and contra dance. They tend to be high-spirited and use a more accentuated style of dance than their Scottish counterparts. Often halfway through the evening, there is a ‘spot’ for the band to take a break and local Morris dancers sometimes perform. English Ceilidhs always feature a caller to lead the dances. Dancers dance in couples for the entirety of a dance and sometimes for several dances. English Ceilidh bands play traditional music, but some bands sometimes incorporate other influences such as rock, ska, French or Welsh music, jazz or funk. Hoe-downs are also community social events. These, however, tend to include American country music and square dances or contra dances. What’s in a Barn Dance? The attraction of barn dancing is the spirit of community it creates. Since it often includes both adults and children, it is a way to enjoy food, dance and company in a lively and comfortable atmosphere. Also, because of the presence of the callers, no experience is necessary for dancers. Members of the community can simply show up ready to participate and have fun. Callers explain the steps to each dance in simple terms before the dance begins and then repeat the steps aloud as the dance happens. Also, the caller is often able to assess the skill level and mood of the party-goers and alter the kinds of dances called accordingly. This ensures a personalised experience for those attending. Callers and bands are also usually happy to accommodate requests from attendees with favourite songs or dances. So if you’re looking to throw an event that will give your guests a taste of tradition and hours of fun, seek out the nearest barn or dance hall and get your family or neighbourhood out on the dance floor!